We examined Indonesian school teachers’ perceptions and expectations about their professional learning, and their justifications for these, before they embarked on a transnational master’s programme carried out in both Indonesia and Finland. The data were collected using the method of empathy-based stories. The findings showed that the teachers expected the programme content, execution and internationality to impact positively on their professional learning, while negative professional learning scenarios were framed as stemming from a lack of personal motivation or lack of support from the Indonesian community. Moreover, the teachers expected to become more skilled professionals not only as teachers in their classrooms but also more widely as experts in their communities. Teachers work amidst the micro-political cultures and practices of their schools and classrooms, which in turn reflect national, regional and local cultures, policies and practices. They navigate through various situations using their unique practical knowledge, which evolves out of their professional training, experiences, values and beliefs (Connelly et al. 1997; Shulman and Shulman 2004). Thus, in teacher learning, the participants should have opportunities “to integrate theoretical knowledge and other “academic stuff” with their own practical knowledge” (Slotte and Tynjälä 2003, 457). While such differences can be a source of professional learning, they can also become an issue in transnational learning environments where the academic staff and participants come from different cultural backgrounds and—both metaphorically and literally—speak different languages. In a study by Juusola and Räihä (2018), the academic staff in a transnational programme named cultural experiences, international teaching, improvement in self-confidence and a supportive learning environment to be the main factors that had enhanced their professional learning. A study on curriculum-making in a dual degree programme showed clearly how the actors created an intersectional space that was both national, international and transnational at the same time (Cheng 2017). The curriculum-making process also revealed how educational understanding and practices can vary among people from different backgrounds. However, little research has been conducted on the professional learning of teachers participating in a transnational MA programme as students, as were the participants in this study. This paper focuses on teacher learning in a Finnish postgraduate programme in teacher education that was carried out in Indonesia and Finland by Finnish academic staff with Indonesian practising school teachers. Such a transnational learning environment provides a novel context for research into practising teachers’ professional learning. We follow Sugimoto’s (2006, 3) broad definition of transnational higher education (TNHE) as “any education or training at higher education level provided beyond national or regional borders through mobility of people, programme or institution”. TNHE has been defined in many ways, and while conceptual differences may exist between definitions, the cross-border programme described in this study clearly meets the above definition (Knight 2002). In the transnational education framework (Knight 2016), the present programme exemplifies the category of independent activities, as no local higher education institution was involved; instead, the sending institution was responsible for the programme curriculum, its implementation and awarding the degree certificates. The programme was operated in the fly-in-faculty mode. The participants’ employer was a foundation which also sponsored the commissioned programme, which was delivered to the participants free of charge to promote their professional learning. Hence, in this paper, we consider what teachers from Indonesia imagine they might experience in a transnational programme organised by a Finnish university. In particular, our aim was to examine the Indonesian teachers’ perceptions, expectations, hopes and fears regarding their professional learning just before their participation in a programme in which cultural differences would be present in many ways: The staff would come from a country with a very different culture; the academic staff and the participating teachers would be communicating in a foreign language, and the teachers would be studying in two countries, Indonesia and Finland, during the programme. Thus, rather than analysing the differences between education systems and schools (e.g. Cowen 2014a, b), this study focused on the participants’ imagined outcomes of their professional learning. The results suggest that teachers’ experiences of professional learning across cultures show hitherto unexamined potentialities. How might the programme change teachers’ ways of thinking and working? Why might the programme change teachers’ ways of thinking and working? Why might the teachers’ ways of thinking and working not change during the MA programme? The programme participants were 30 teachers from three private schools in Aceh, Indonesia. Candidates for participation had been pre-selected by the foundation operating the schools. The final selection, based on the application documents, was made at the University of Tampere. The Finnish academic team and the programme administrator from the University of Tampere had already met the applicants in August 2015 on a visit to Aceh. Most participants had a bachelor’s level degree or equivalent in a school subject, or other school-related subject (e.g. counselling, engineering). All teachers had either been granted a teaching certificate by an Indonesian institute, and/or they were acknowledged by the school principal on their teaching experience. The programme was a combination of coursework and a thesis, and it ran from December 2015 to June 2017. The programme followed the curriculum of the MA in Teacher Education taught at the University of Tampere. The content of the programme (120 ECTS) included 12 ECTS of free-choice studies; these comprised 8 ECTS in English language studies and 4 ECTS in teaching methods and didactics, and were negotiated in collaboration with the sponsoring organisation. The participants attended the programme full-time. Most of the teaching was carried out in Aceh by academic staff from the University of Tampere. The 14 study modules taught on-site were given in 1-week-long periods. Most of the modules included pre-assignments aimed at orientating the participants for the next intensive on-site study session. The Indonesian teachers also visited Finland for a month in March 2017 as an integral part of the programme. During their visit, the teachers studied three modules, each of which included several school visits with targeted observation assignments. In addition to the 14 study modules, the teachers wrote their master’s thesis. The sponsoring foundation provided the study facilities to the participants as well as facilities, including accommodation, for the Finnish academic staff during their on-site visits. The teaching was organised on school premises run by the foundation. The students’ degrees were recognised in Indonesia once the programme had been added to the Indonesian accreditation system. The University of Tampere supported the accreditation process. For the purposes of this paper, we approach the master’s programme as a space for the participants’ professional learning. We understand teacher learning to comprise various forms, as in the conceptualisation by Marton and Booth (1997). Their six conceptions of learning which form a continuum from surface-level to deep-level learning also apply in teacher learning. According to the first three conceptions, in which learning is primarily approached as knowledge reproduction, teachers can increase their knowledge, memorise and reproduce information, and apply knowledge in their work. According to the other three conceptions, in which learning is primarily approached as seeking meaning, teachers learn to understand, learn to see something in a different way and change as a person. The last two of these are close to Mezirow’s (2009, 103) definition of transformative learning as “a rational, metacognitive process of reassessing reasons that support problematic meaning perspectives or frames of reference, including those representing such contextual cultural factors as ideology, religion, politics, class, race, gender and others”. However, this conceptualisation places little emphasis on the social and collective aspects of learning which are essential in teachers’ professional learning. In searching for a broader conceptualisation that would cover the cognitive, emotional and social dimensions of learning, Illeris (2014a, b) has suggested a re-definition of transformative learning as learning that implies changes in one’s identity. The choice of identity as the target of transformative learning, Illeris (2014b) argues, widens the understanding of transformative learning from merely a cognitive process into something that is situated, societal and embedded in the surrounding contexts. This conceptualisation comes very close to that of teacher learning by Putnam and Borko (2000) who view it as situated in specific contexts, social in nature and distributed across persons and tools (see also Sammons et al. 2007). Moreover, Darling-Hammond and Richardson (2009) elaborate effective teacher learning as a continuous process of active learning, practice and collaborative reflection with colleagues. Thus, a supportive community in which, through full and free participation in dialectical discourse, a teacher can reflect critically on one’s assumptions and expectations, is necessary for transformative learning (Mezirow 2009; see also Shulman and Shulman 2004). Moreover, the role of imagination is important in initiating transformative learning, as teachers need to be able to understand the possibility of other meaning perspectives or frames of reference (Mezirow 2009). Transformation takes two forms, a sudden epochal transformation that can result from a professional crisis (e.g. Meijer 2011), or cumulative transformation that develops over time. Finland has a population of 5.5 million, and it exemplifies a Nordic welfare state known for its strong public sector. A central responsibility of the Finnish public sector is education. Education in Finland is a universal right, meaning that all individuals should have equal opportunities to educate themselves regardless of their socio-economic background, gender, regional location of residence or any other factor that could weaken their possibility to study. In pursuit of this goal, education in Finland, including elementary school, lower and upper secondary school, and vocational and higher education, is free of charge. For higher education students from non-European union member countries, tuition fees were introduced in 2016–2017, but these fees remain at a very modest level compared to those levied in many other countries. Finnish higher education institutions thus find themselves in a new situation, as the Finnish Government and the Ministry of Education and Culture would like to see Finnish HEIs placing more emphasis on selling education to other countries (Ministry of Education and Culture 2016; Finnish Government 2015). Currently, higher education accounts for 1.7% of Finland’s gross domestic product (GDP), which is slightly over the average in the world in higher education funding (OECD 2018). Since the 1970s and the transition to a comprehensive education system, all children have the same schooling up to the age of 16. After finishing comprehensive education, youngsters can exit education or continue in general or vocational upper secondary education or a combination of these; most opt to continue studying. The usual path after vocational or upper secondary school is to a polytechnic or university. Both institutions have entrance examinations. A person can also enter university without an upper secondary school diploma, if he or she passes the entrance examination or is otherwise deemed to possess the capacity and knowledge required for a university education (Saarivirta 2009). The Ministry of Education and Culture governs almost all the education institutions in Finland. Teaching is a highly valued profession in Finland. Teachers are required to obtain a Master’s degree including teachers’ pedagogical studies (60 ECTS), and nearly 90% of the basic education teachers are qualified (National Board of Education 2013). High quality teacher education programmes are organised across the country, and due to their popularity among the applicants, only 10% of the applicants are accepted (National Board of Education 2013; Malinen et al. 2012). Indonesia, with approximately 261 million inhabitants, is the world’s fourth most populous nation. The largest economy in the Southeast Asia region, Indonesia is also characterised by considerable linguistic and ethnic diversity, with over 300 ethnic groups, 700 languages and six religions. Indonesia is also known as the largest Muslim-majority country in the world. According the World Bank (2017), Indonesia is an emerging middle-income country. Indonesian higher education is very diverse (Logli Forthcoming; Moeliodihardjo 2014). Five types of institutions exist: Two of these, academies and polytechnics, are vocational, and three, colleges, institutes and universities, are academic. These institutions can be private or public, and secular or religious. All come under the jurisdiction of the Ministry of Education and Culture (MoEC), except for Islamic institutions, which are managed by the Ministry of Religious Affairs (MoRA). The geographical and political environment of Indonesia is challenging. Geographically, the population is spread over more than 900 islands, while over 70% of HEIs are located on the two main islands of Java and Sumatra (Moeliodihardjo 2014), which is one reason why students from the higher social classes, an urban environment and Java, are overrepresented in higher education. In general, the Indonesian higher education system is currently facing serious challenges regarding access, equity and quality (Logli Forthcoming; Susanti 2011). For example, the quality of institutions varies widely, as does their accreditation status. Although most higher education institutions in Indonesia are private, the general quality of education is better in those in the public sector owing, for example, to the higher qualifications of their academic staff (Logli Forthcoming). Moreover, the Indonesian higher education system has been, and remains, in the middle of a process of decentralisation and privatisation that involves change in its funding. For decades, while the public sector institutions have mainly been funded by the government, private institutions have been required to cover their costs primarily through student fees. However, with cuts in government funding, the public sector universities are also trying to pay their way. This has led some of those with the status of autonomous state institutions, and thus more financial freedom, to establish a “special passage” for students who, although less successful in the national entrance exam, can afford to pay higher tuition fees (Welch 2007). This route is supposed to be limited to a maximum of 20% of the student intake (Susanti 2011). On average, having a family member in higher education would account for one third of the household’s annual expenditure (Logli Forthcoming). Compared to Finland, the Indonesian education system faces several challenges, from gaining access to financial resources to lack of up-to-date equipment, and from the quality of the student experience to the global ranking of the institutions themselves (Gao 2015). Also, the number of unqualified teachers is considerably high: Only 37% of all teachers are qualified, and every fourth teacher has a secondary school education or less (Suryahadi and Sambodho 2013). Moreover, teaching is often based on lecturing and other teacher-centred methods from primary to higher education and teacher training (Bjork 2013). As part of the problem are the micro-political cultures and practices of schools and classrooms, Bjork (2013) calls for professional learning which would change teachers’ views of themselves as obedient civil servants to professionals who have knowledge and skills to enhance student learning and work as educational leaders. Thus, providing teachers with an opportunity to learn in a transnational programme such as described in this study could be a way to develop school systems, providing that the teachers are given autonomy to adapt what they have learned to local circumstances and classrooms rather than taking an up-to-down approach and directly importing new practices from a foreign school system (Elliott 2014). Additionally, in a country like Indonesia, where access to higher education is a problem for people from low socio-economic backgrounds, and those from rural areas (Rosser and Joshi 2013), bringing the programme to the students could be a means to enhance educational equality. It is 1 year after your graduation. You notice that the MA programme has changed your ways of thinking and working. Describe why your ways of thinking and working have changed. It is 1 year after your graduation. You notice that despite your studies in the MA programme, your ways of thinking and working have not changed and you continue working as usual. Describe why your ways of thinking and working have not changed. MEBS was used in this study, as the resulting stories may provide new and unexpected insights into the topic of interest. MEBS has also been considered an ethically sensitive method of data collection as it allows the participants to freely express themselves without any limiting external pressures. In comparison to personal interviews, MEBS has the advantage that it lacks face-to-face interaction, which could distort the results, as interviewees are more likely to give socially desirable answers and present themselves as more agreeable in interview situations (e.g. Krumpal 2013; van der Heijden et al. 2000). MEBS is based on participants’ imagined stories and thus is well suited for examining participants’ perceptions and expectations regarding specific phenomena, including those they have not yet personally experienced. Furthermore, empathy-based stories are particularly useful for examining cross-cultural and critical issues from participants’ perspectives, such as secondary school girls’ educational attainment in Tanzania (Lehtomäki et al. 2014; Posti-Ahokas 2013). The data were collected at the beginning of a class by two Finnish lecturers who handed everyone a paper with the randomly assigned, change or no-change, frame story based on which they were to write their imagined story in English. The respondents were allowed 30 min to write their stories during which they were unaware of the existence of the alternative scenario. After the respondents had handed in their stories, the teacher told them about the two frame stories. All the participants (n = 39) were Indonesian school teachers who had applied for the MA programme but had not yet been admitted to it. Because the selection procedure was unfinished, participation in the orientation module was open to all. We analysed the stories using qualitative data-driven content analysis (Merriam 2009, 178–193). We chose to conduct the analysis inductively because of scant previous research on the topic and because we were interested in developing new insights. Content analysis allowed us to focus systematically on the content of the stories and the emerged themes. In the first phase, we read through the transcribed stories multiple times to gain a holistic picture of the data and to narrow the data down to those stories that would help in answering the research questions. In this phase, we excluded five stories that were not relevant to the research questions and/or which were incomprehensible in English. The data for analysis consisted of 34 stories (12 by males and 22 by females), of which 21 were success stories and 13 failure stories. This uneven distribution was a chance outcome of the initial random assignment of the two frame stories. In the second phase, the data were organised according to the three research questions. For each research question, data excerpts were coded, and categorised in a table. All excerpts were numbered with reference to the original story and the author’s gender noted: for example, “21m”. The frequencies of the respondents in each category were calculated. In the third phase, three example stories, two typical positive stories and one typical negative story, were constructed from the data to yield a generalised and condensed picture of the findings. For each story, data excerpts exemplifying the largest number of respondents in each category were selected. In the typical positive stories, the codes that appeared in at least four teachers’ stories were included, and in the typical negative story, the codes that appeared in at least two teachers’ stories were included. The variation in numbers is due to the lower amount of descriptive content in the negative frame stories compared to the positive frame stories. In the typical negative story, data excerpts from seven teachers were used; in the typical positive stories, excerpts from nine (success story 1) and seven (success story 2) teachers were used. Following Polkinghorne’s concept of narrative analysis (1995), we organised the selected data excerpts into a coherent story. While original excerpts form the basis of the stories, a few words and phrases were added to improve readability. The example stories sum up the teachers’ perceptions and are followed by interpretations with more citations from the original data. The analysis was cross-checked following two procedures. First, we checked that for each excerpt, the interpretations made matched its original context. Second, we discussed the categorisations as well as the construction of the three example stories in the research group meetings and thus applied analyst triangulation (Patton 2015, 665–667). Each sub-section will be illustrated with an example story, followed by an interpretative discussion. In the following sections, the original excerpts are enclosed in quotation marks, and categories are shown in italics. Success story 1: why did the programme change the student’s ways of thinking and working? Three things about the MA programme were significant in changing my thinking and working as a teacher. The content and the methods of the programme were relevant, especially the information and knowledge I got from the programme regarding teaching methods and classroom management. The programme was research-oriented, so I acquired a lot of theories about teaching and learning. The MA programme also forced the students to work harder and provided many opportunities to study in a more professional way. Moreover, because I took the MA programme in a different country, we had to reflect on the society in which we work and live. The programme gave me new knowledge, experience, and information about the education system in Finland and in my own country. The stories revealed three major factors that the teachers perceived as inducing change in their ways of thinking and working: the content, execution and international nature of the programme. The content of the MA programme, for example, learning “many skills about pedagogy”, seemed very important for the teachers, as also was theoretical “knowledge about education”. In addition to knowledge on classroom practices and educational knowledge, the teachers thought that “information and knowledge on education system” would affect their thinking. Moreover, the link between research and education was presented as a new idea: “understanding how to do a good research to improve the teaching process in the classroom”. The programme taught me how to learn, forced me to think a lot and to find a lot of resources to make myself think in various ways, The MA programme also forced the students to work harder (13f). Success story 2: how did the programme change the student’s ways of thinking and working? The MA changed my way of thinking in several ways. After having completed the MA programme, I was able to change my teaching method and make it more diverse. This would make it easier for the students to understand the topic I am teaching. I can now make the class more comfortable than before because I know how to manage the class. I have gained new knowledge about how to manage conflicts or solve a conflict, which has made me an expert in problem solving. During the programme, my thinking about how to be a good teacher changed; for example, I realised that a teacher must not only be able to give students information but she or he needs to guide a student in their character. I am grateful for the opportunity to study in this programme. What I got from the MA programme I will share with my friends and teachers in this school, and we must implement all of it in our classrooms. The MA programme was perceived as effecting change in teachers’ thinking in four areas. The stories mentioned improvement in teachers’ pedagogical skills as well as the development of their working skills, change in one’s pedagogical thinking, and the transformative process of becoming an expert. Improvement in one’s pedagogical skills was described through concrete classroom practices: learning “how to implement various methods of teaching” and better understanding of “how to manage the classroom”. Along with these seemingly technical skills, mention was made of the idea of an increased focus on the students in the classroom. This was described as an increased focus on the individual needs of students, and as getting students involved in the learning process rather than treating them as passive objects of teaching and instruction. The ideal of “how be a good teacher” would be changed towards one of a teacher who is “helping my students in their learning process and even increasing their abilities to achieve their learning goals”. The basis of this might be in learning to see “one thing from many different way and point of view”. The fourth area of changed thinking was in what could be termed the transformative process of becoming an expert, becoming a person with “high responsibility and ability” in one’s community. In four stories, “sharing” one’s expertise was a part of becoming someone “whose knowledge and experiences will become an inspiration to my students and my family”. In addition to an expert role based on knowledge and experiences, being “a reflective model” made it possible “to demonstrate high ethical standard” and other values in one’s community. Failure story: why were the student’s ways of thinking and working unchanged after the MA programme? In my opinion, my ways of thinking and working did not change for several reasons. First, I am not very diligent in studying, so I got left behind my classmates. It is also really hard for me to come out of my comfort zone. I like to stick with my old perceptions and believe that my ways of thinking and working are already on the right track, so it is hard for me to adopt new ways of thinking and working. Second, it was really difficult for me to understand the teachers and to follow the instructions because they used different learning methods and teaching styles than those I was used to. In addition, we had very little practical training in classrooms, so it is likely that I forgot everything that I learned very quickly. The final reason can be found in the school system of Indonesia. Our school system does not encourage teachers to apply new teaching methods and strategies, even though this would develop our students’ skills and the quality of teaching. This limits our opportunities for professional development because we are not allowed to apply new ways of working even if we had the desire to do so. Personal reasons aside, the lack of social and institutional support was also described as something that might hinder the development of a teacher’s capabilities. In three stories, the teachers wrote about an unsupportive school system in Indonesia that does not encourage teachers to develop their abilities. In one story, a teacher wrote about how he failed to convince the school management about his new ideas and felt that he needed like-minded partners or colleagues before he could implement his new ideas and ways of working in practice. It was noteworthy that mismatch between the teachers and the programme was mentioned in only three failure stories. In these stories, problems were the outcome of being confronted by a different culture, religion or teaching methods. These teachers explained that they would find new ways of teaching inhibiting, making it impossible for them to implement their learning in practice. The teachers also expressed a desire and need to implement what they had learned in practice. In four stories, failure to do this was mentioned as a barrier to why their ways of working and thinking did not change. The aim of this paper was to explore the perceptions, expectations, hopes and fears regarding their professional learning of a group of Indonesian teachers about to participate in a transnational programme organised by a Finnish university. The findings showed that positive scenarios were related to programme content and execution and to the transnational nature of the programme, while negative scenarios, not leading to any change, were related to lack of personal motivation or lack of support from the Indonesian community. Moreover, the positive story writers imagined that they would become more skilled professionals not only in their classrooms but also more widely as respected experts in their communities. The programme could thus be understood as a nexus for different understandings of teacher’s professional knowledge: the Indonesian teachers’ existing knowledge gained in their earlier teacher training, their experiences as teachers in Indonesia, and the Finnish curriculum on teacher education implemented by Finnish teacher educators. The participants described their learning as a multi-dimensional, temporal process. Nearly all the conceptions of learning identified by Marton and Booth (1997) were found in the participants’ stories about their learning expectations: The participants expected the programme to add to their knowledge of pedagogy and research methods and the application of that knowledge in their classrooms. They also expected to learn more about, and thus understand, the Finnish culture, which in turn would lead them to see their own culture in a different light. Moreover, the participants clearly expected the programme to change them as a person. The participants’ learning conceptions were given various meanings and were interrelated in their stories. For example, the participants emphasised that professional learning would not occur, or not last, if they lacked possibilities to apply their new knowledge in practice. Thus, the Indonesian teachers’ understanding of teacher knowledge such as new skills and methods, as something that cannot be learnt thoroughly without experimentation in the classroom, is in line with earlier conceptualisations of professional learning by Western researchers (e.g. Korthagen 2017; Tynjälä 2008). This result also supports earlier findings on expertise development, according to which experience does not automatically translate into expertise but requires the deliberate practice and integration of theoretical and practical knowledge (e.g. Slotte and Tynjälä 2003; Tynjälä et al. 2003; Wallin et al. 2018b). In addition, the participants appeared to be aware of their own learning conceptions. For example, they described how their understanding of learning would change from knowledge reproduction into meaning-seeking, and how this would affect their own teaching practices. Thus, the participants not only emphasised the importance of seeking meaning in their own learning but also considered this as something they could transfer to their classrooms. These changes in one’s thinking illustrate the transformative nature of the participants’ learning (Illeris 2014a; Mezirow 2009), which seemed to derive from their learning experiences in and between two cultures. However, contradictory meanings were attributed to studying between two cultures in a transnational programme. On the one hand, the participants approached cultural differences as opportunities to reflect on their thinking; on the other hand, they described the programme as a learning community where studying with new teaching methods and in a foreign language could constitute obstacles to their learning. Nevertheless, boundary crossing of this kind between different, partly unfamiliar, contexts requires teachers to expand their perspectives, adapt to new situations and in this way develop as professionals (e.g. Engeström et al. 1995, 319; Wallin et al. 2018b; see also Akkerman and Bakker 2011). The findings also illustrate the complexity of transformative learning as a situated, socially and culturally embedded process (Illeris 2014b). In particular, one’s professional learning was closely linked to the community, the latter serving both as a facilitator and a barrier to the implementation of new knowledge and skills. The teachers imagined their schools as reluctant to develop new practices, an attitude that might lower their motivation to implement new ideas and ways of working. This raises the issue of the essence and permanence of transformative learning. Both Mezirow (2009) and Illeris (2014a) seem to assume that transformation in one’s thinking results in new practices, but what if the local community prevents a person from changing anything? Although the programme was narrated as a learning community that would support the participants’ transformative learning, further research is needed on what happens when participants in a transnational learning environment return to their workplaces. The earlier literature on teacher learning emphasises the importance of supportive communities and reflection with colleagues (e.g. Darling-Hammond and Richardson 2009). Interestingly, however, while the present participants saw themselves as embedded in several learning-related communities in which they had different roles, peers were not narrated as equal co-learners in any of the communities. In fact, peers were absent from the stories about the programme. In the stories about school communities, fellow teachers were narrated as learners with whom the programme participants would share their knowledge. The stories were rather reflective, but for some reason, the participants did not imagine that they would reflect on their thinking and practices with either their peers in the programme or those in their schools. This study has its limitations. One is related to the use of English as a mediator language between two cultures: The teachers wrote their stories in a foreign language, which produced foreign-language data for most of the authors of this paper. The data might have been richer in details, meanings and nuances if written in the participants’ native language; however, it is unlikely that this would have affected the main themes. Furthermore, it is important to note that empathy-based stories are plausible imaginary stories and not always literal descriptions of reality. The constructed stories portray plausible, possible and potential connections, which might or might not be based on personal lived experiences. In MEBS, “the ability of the stories to reflect and express meaning is considered more relevant than the factual occurrence of the events described in the stories” (Wallin et al. 2018a; see also Bell 2002; Polkinghorne 2007). Thus, the findings of this study reflect the views, insights and perceptions that the teachers had about the programme and their professional learning during the time of the data collection and does not necessarily correspond to their actual experiences. However, even if stories are not based on lived experiences, they are often based on culturally shared genres and meanings. Therefore, it would be fruitful to test the findings and continue investigating the topic with other research methods. The timing of the data collection also needs to be considered, as the stories might have been different if the participants not yet met any of the Finnish staff, or if the stories had been written after several months of participation in the programme. The major contribution of this work revolves around three main findings. First, the pedagogical content of the programme was narrated by the participants as matching their learning needs, a finding which leads us to conclude that the topics addressed are considered important for school teachers in both cultures. Second, the stories draw a picture of a complex network of relations—people, cultures and languages—which shape teachers’ professional learning and long-term development. However, the absence of their fellow students as co-learners in the stories is interesting and requires further research. Third, this study showed that cultural differences, which are always present in transnational higher education, can become either learning opportunities or obstacles to learning. This suggests that in transnational higher education, attention should be actively paid to cultural differences. In sum, the main conclusion of this study is that transnational teacher education provides professional learning on many levels: not only in content but also as a learning environment that allows participating teachers to reflect on their professional practices and identities. However, further research is warranted to study learning experiences during and after such a programme. Akkerman, S. F., & Bakker, A. (2011). Boundary crossing and boundary objects. Review of Educational Research. https://doi.org/10.3102/0034654311404435. Cheng, M. W. (2017). The southeast Asian higher education space: Transnational, international or national in new ways? European Educational Research Journal. https://doi.org/10.1177/1474904117699627. Connelly, F. M., Clandinin, D. J., & He, M. F. (1997). Teachers’ personal practical knowledge on the professional knowledge landscape. Teaching and Teacher Education. https://doi.org/10.1016/S0742-051X(97)00014-0. Cowen, R. (2014a). Comparative education: Stones, silences, and siren songs. Comparative Education. https://doi.org/10.1080/03050068.2013.871834. Cowen, R. (2014b). Ways of knowing, outcomes and “comparative education”: Be careful what you pray for. Comparative Education. https://doi.org/10.1080/03050068.2014.921370. Elliott, J. G. (2014). Lessons from abroad: Whatever happened to pedagogy? Comparative Education. https://doi.org/10.1080/03050068.2013.871835. Hoekstra, A., & Korthagen, F. (2011). Teacher learning in a context of educational change: Informal learning versus systematically supported learning. Journal of Teacher Education. https://doi.org/10.1177/0022487110382917. Illeris, K. (2014a). Transformative learning and identity. Journal of Transformative Education. https://doi.org/10.1177/1541344614548423. Illeris, K. (2014b). Transformative learning re-defined: As changes in elements of the identity. International Journal of Lifelong Education. https://doi.org/10.1080/02601370.2014.917128. Juusola, H., & Räihä, P. (2018). Exploring teaching staff’s experiences of implementing a Finnish master’s degree programme in teacher education in Indonesia. Research in Comparative and International Education. https://doi.org/10.1177/1745499918775208. Knight, J. (2016). Transnational education remodeled: Toward a common TNE framework and definitions. Journal of Studies in International Education. https://doi.org/10.1177/1028315315602927. Lehtomäki, E., Janhonen-Abruquah, H., Tuomi, M. T., Okkolin, M.-A., Posti-Ahokas, H., & Palojoki, P. (2014). Research to engage voices on the ground in educational development. International Journal of Educational Development. https://doi.org/10.1016/j.ijedudev.2013.01.003. Malinen, O.-P., Väisänen, P., & Savolainen, H. (2012). Teacher education in Finland: A review of a national effort for preparing teachers for the future. The Curriculum Journal. https://doi.org/10.1080/09585176.2012.731011. Posti-Ahokas, H. (2013). Empathy-based stories capturing the voice of female secondary school students in Tanzania. International Journal of Qualitative Studies in Education. https://doi.org/10.1080/09518398.2012.731533. Putnam, R. T., & Borko, H. (2000). What do new views of knowledge and thinking have to say about research on teacher learning? Educational Researcher. https://doi.org/10.3102/0013189X029001004. Rosser, A., & Joshi, A. (2013). From user fees to fee free: The politics of realising universal free basic education in Indonesia. The Journal of Development Studies. https://doi.org/10.1080/00220388.2012.671473. Sammons, P., Day, C., Kington, A., Gu, Q., Stobart, G., & Smees, R. (2007). Exploring variations in Teachers' work, lives and their effects on pupils: Key findings and implications from a longitudinal mixed-method study. British Educational Research Journal. https://doi.org/10.1080/01411920701582264. Shulman, L. S., & Shulman, J. H. (2004). How and what teachers learn: A shifting perspective. Journal of Curriculum Studies, 36. https://doi.org/10.1080/0022027032000148298. Slotte, V., & Tynjälä, P. (2003). Industry–University collaboration for continuing professional development. Journal of Education and Work. https://doi.org/10.1080/1363908032000093058. Susanti, D. (2011). Privatisation and marketisation of higher education in Indonesia: The challenge for equal access and academic values. Higher Education. https://doi.org/10.1007/s10734-010-9333-7. Tynjälä, P. (2008). Perspectives into learning at the workplace. Educational Research Review. https://doi.org/10.1016/j.edurev.2007.12.001. Tynjälä, P., Välimaa, J., & Sarja, A. (2003). Pedagogical perspectives on the relationships between higher education and working life. Higher Education. https://doi.org/10.1023/A:1024761820500. Wallin, A., Koro-Ljungberg, M., & Eskola, J. (2018a). The method of empathy-based stories. International Journal of Research and Method in Education. https://doi.org/10.1080/1743727X.2018.1533937. Wallin, A., Nokelainen, P., & Mikkonen, S. (2018b). 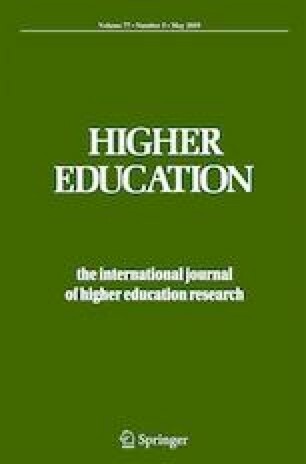 How experienced professionals develop their expertise in work-based higher education: A literature review. Higher Education. https://doi.org/10.1007/s10734-018-0279-5. Welch, A. R. (2007). Blurred vision? Public and Private Higher Education in Indonesia. Higher Education. https://doi.org/10.1007/sl0734-006-9017-5. Zwart, R. C., Wubbels, T., Bergen, T. C. M., & Bolhuis, S. (2007). Experienced teacher learning within the context of reciprocal peer coaching. Teachers and Teaching: Theory and Practice. https://doi.org/10.1080/13540600601152520.